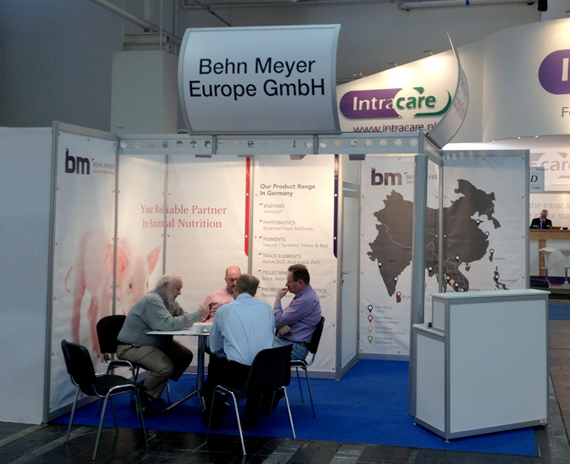 Behn Meyer Europe GmbH exhibited with its own booth at the „Eurotier" fair 2012 from 13-16 November in Hanover, Germany. The "Eurotier" is the most important trade exhibition in animal production in Europe and one of the biggest worldwide. More than 2400 international exhibitors and 160.000 visitors came, which shows the importance of agriculture for human nutrition. The exhibition has also been used to introduce Behn Meyer’s new feed brands "SapoVit" and "PhytoVit E". These products are natural botanical complementary feed additives which support animals in feed conversion and health. Other promoted product groups are prebiotics, probiotics, pigments, trace elements and pellet binder. The customer feedback was very positive because the market is looking for natural products as antibiotic alternatives which are more demanded from end users. Many suppliers and customers from all over the world visited our booth and we plan to exhibit again in 2014.